SAN FRANCISCO--(BUSINESS WIRE)--Visa Inc. (NYSE:V) today announced continued global success of Visa Checkout, the online check out service that allows shoppers to pay with their cards online and on any device, with just a few clicks. In recent months, no less than thirty-three new merchants, ranging from Best Buy and Under Armour to Barnes & Noble and Taco Bell, have signed on to offer Visa Checkout. China: China Merchants Bank, Shanghai Pudong Development Bank, China Everbright Bank, Bank of Guangzhou, and The Card Center, China Minsheng Banking Corp. Ltd.
As of August 10, 2015, China Merchants Bank (CMB) and Shanghai Pudong Development Bank (SPDB) are the first two issuers in the world who have launched Visa Checkout’s mobile app inline provisioning within their banking apps, providing their customers with an easy way to enroll in Visa Checkout for shopping online at overseas merchants. Visa Checkout’s early success is due not only to its international expansion, but also to a series of successful co-marketing campaigns that have helped drive consumer usage while bringing new value to our innovative partners’ brands. For example, during a recent co-marketing campaign with Visa Checkout, Gymboree observed that nearly half (43 percent) of customers using Visa Checkout to make a purchase were net new customers to their Gymboree site. To kick-off the fall, Visa Checkout will partner with The Ellen DeGeneres Show for the season 13 premiere week. Viewers will see Visa Checkout and key merchant partners in and around Ellen’s exciting premiere week, both in Los Angeles and New York City. Visa Checkout will launch several new global co-marketing campaigns with merchants this fall, ranging from consumer promotions to social media campaigns and sponsorship marketing. Merchants that have previously partnered in successful promotional campaigns include Dunkin’ Donuts, Fandango, Gymboree, Pizza Hut, Virgin America, Williams-Sonoma and zulily in the U.S., Cineplex Theatres and Indigo Books & Music in Canada and Freedom Pizza in the United Arab Emirates. The expanded list announced today brings the number of merchants offering Visa Checkout to nearly a quarter million globally, while financial institution partners have grown to over 330. In just the last two months alone, Visa Checkout saw a surge of activity, with an average monthly enrollment growth rate of over 30 percent in June and July 2015. Only one year after launching, the service has more than six million registered users, and has seen registered user sign ups increase by more than 92 percent since the beginning of 2015. Visa Checkout is an online service from Visa that allows consumers to securely store their shipping and payment information without ever having to re-enter the information when shopping online. With Visa Checkout, consumers can simply enter their username and password, and click a button to complete the purchase. Since its launch less than a year ago, more than six million customers have signed up for Visa Checkout accounts. 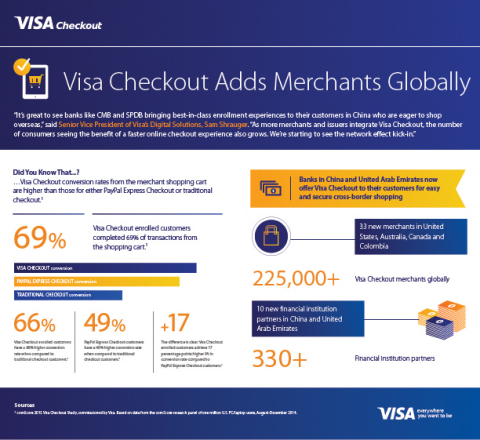 Nearly a quarterly million large and small merchants and over 330 financial institution partners now offer Visa Checkout globally. These represent some of the biggest retailers on the internet, including Staples, Rakuten, Neiman Marcus, Gap, Pizza Hut, Orbitz, and Virgin America.